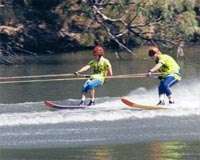 NSW Ski Gardens is located on the banks of the Hawkesbury River 1.2km from the small township of Wisemans Ferry , and is owned by NSW Water Ski Federation. 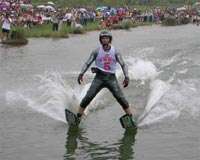 It is popular with many river users, such as water skiers, fishermen, pushbike riders, campers and holiday makers. 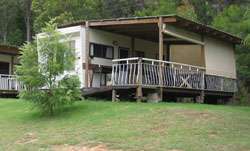 The Ski Gardens maintains a rustic charm, giving you somewhere to escape but still have the conveniences you require. 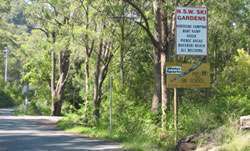 Facilities include: Wide boat ramp Weekend kiosk: ice, hot food, icecreams, drinks, etc Sheltered riverside picnic area BBQs Water Ski School ? 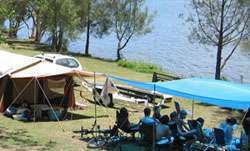 Wisemans Ferry Water Sports Shady trees and ski beaches Camp sites powered and unpowered (most on the river bank) Cabins Clean amenities Cabins sleep 6 persons and include all cooking facilities and BBQs, with a shaded verandah. 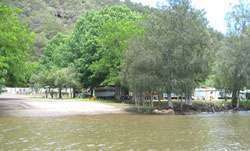 Please bring your own linen and towels. 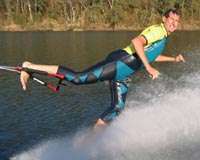 (ensuite toilet , showers at amenities, No airconditioning or TV).